The SAP Fan Club Forums • View topic - The benefits of open source. (Serious fun for April 1st). Re: The benefits of open source. (Serious fun for April 1st). 000451 CREATE DATA lo_s_all LIKE LINE OF <fs_t_all>. Last edited by Snowy on Wed Jul 11, 2018 10:22 am, edited 1 time in total. replace all occurrences of crlf in e_mdx with space. if is_timepoint-date between '15821005' and '15821014'. 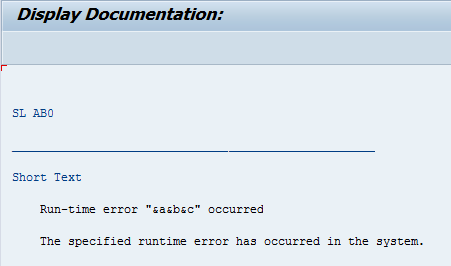 Well, top marks for SAP testing every possible input, I suppose.